The real star of this week's episode is the USS Enterprise. Stamets (Anthony Rapp), Saru (Doug Jones), Tyler (Shazad Latif), Spock (Ethan Peck), Bryce (Ronnie Rowe), Owosekun (Oyin Oladejo), Rhys (Patrick Kwok-Choon) and Tilly (Mary Wiseman) stand ready for their next journey in the "Star Trek: Discovery" episode "Such Sweet Sorrow. Code zero zero zero. Spoilers. Zero. Last week, "Star Trek: Discovery" showed signs of returning to form in "Through the Valley of Shadows." Sadly, however, this week — like a giant, planet-size pendulum and an all-too-frequent occurrence on this show — it swings all the way back and gives us an episode that misses the mark, failing to live up to its potential it had. "Such Sweet Sorrow" starts with a voiceover from Cmdr. Burnham (Sonequa Martin-Green) explaining how the Discovery must be set to self-destruct because it contains the one thing in the galaxy that Control needs: the data to become fully conscious. The Discovery rendezvous with the Enterprise and a ghastly-looking, wholly impractical, 500-meter, new-for-"Discovery" extending bridge is used to connect the two ships: that probably cost the visual-effects team twice as much as a few teleportation effects would have. No explanation is given as to why the transporters aren't used — whoever came up with this ridiculous idea should be fired from the writer's room immediately. On the plus side, we get our first proper look at the bridge of the Enterprise, and it's gorgeous. Capt. Pike (Anson Mount) makes yet another throw-away explanation as to why holographic communications will no longer be used; we can only assume that he's referring to the Enterprise, 'cause you can almost certainly guarantee that we'll see them again on Discovery. While packing up everything from Discovery, Burnham prepares to stow the time crystal away safely and handles it directly; consequently, she gets a flash of what's to come. We see what looks like a giant space battle. Injured people are everywhere, and an undetonated photon torpedo is wedged into the hull of the Enterprise. Much to everyone's surprise, the self-destruct command to Discovery doesn't work, so the Enterprise unloads a volley of torpedoes at the ship — but somehow Discovery's shields have been raised. Pike et al deduce that the data from the sphere has merged with the Discovery's computer systems, to the extent that it's now capable of taking more drastic measures to defend itself. Burnham keeps getting flashes of the future, but with more detail this time. We see Leland (Alan Van Sprang) walking onto the bridge of the Discovery and blasting everyone in sight before throttling her. To all intents and purposes, the actions of the crew of the Discovery, and Burnham in particular, are being guided by both the red signals, which the crew has been following over the course of the season, and the flash-forwards provided by the time crystal. The penny drops and Burnham realizes the very reason that the crew was guided to getting a time crystal by the appearance of the fifth signal in last week's episode was so that they could take the USS Discovery into the future and out of the reach of Control. Thus, as most fans have more or less guessed by now, that plot point will eventually tie in with the last remaining "Short Trek" that hasn't been referenced yet, "Calypso," which follows Discovery, deserted, in the far future. A discussion in the officers' briefing room results in a plan to construct another time suit, and naturally only Burnham can use it, because the original was tailored to her mother's DNA. The reason why a new suit cannot be tailored to new DNA is not explained. Other incredibly significant challenges such as actually flying it are explained away by the fact that apparently her mother left instructions in her video log. We assume that Burnham has to mention this the next time she sees her mother, so that Burnham will know how to do it. Such are the perils of time travel. The officers also theorize during this meeting that Burnham is indeed responsible for the red signals, travelling through time to orchestrate their precise appearances and guide the Discovery crew to the relevant pieces of the puzzle. A red signal appears, the sixth of seven, and it's over a planet called Xahea. If this sounds familiar, it's because it featured in the very first "Short Trek," entitled "Runaway," that aired back in October of last year. So, one more episode, one more red signal, and one more "Short Trek" reference still left to go. With Leland (Alan Van Sprang) and an armada of 30 Section 31 ships under his control fast approaching, a deadly confrontation is imminent. Thankfully, though, Number One (Rebecca Romijn) took the liberty of retrofitting the Enterprise's shuttle and landing pod complement with enhanced phasers, and she commandeered the new experimental tactical fliers, so that's good. Lt. Stamets (Anthony Rapp) and Dr. Culber (Wilson Cruz) have a genuinely touching moment, and share the details of what each of them plans to do after all of this is over. Stamets says he might take a sabbatical from Starfleet and enroll at the Vulcan Science Academy, and Culber says he's taking a post on the USS Enterprise. Tilly's friend, Queen Me Hani Ika Hali Ka Po (Yadira Guevara-Prip), arrives to help. Discovery uses its spore drive to reach Xahea instantly, while Enterprise must follow behind at warp speed, and arrives a little later. Upon reaching the class-M planet, Tilly (Mary Wiseman) gets giddy at the chance of seeing Queen Me Hani Ika Hali Ka Po, which becomes shortened to just Po (played by Yadira Guevara-Prip) once again — a character those who watched the "Short Trek" will be familiar with. While it's nice to see her again, Po brings little to this episode aside from her technical knowledge and some comedic relief. We learned in "Runaway" that she had developed a way to … er, recrystallize dilithium, something that Capt. Scott specifically said in "Star Trek: The Voyage Home" was impossible, even in the 23rd century. That is, until Capt. Spock theorized that injecting high-energy photons from a 20th century nuclear reactor into a dilithium chamber might cause crystalline restructure. Perhaps, then, this technology remains on Xahea and never makes its way to the United Federation of Planets. Po plans to modify her dilithium incubator to trigger an ongoing cascade of energy within the crystal by combining it with dark energy. Apparently, that will replicate the power of a supernova … and charge the time crystal. Easy. The only downside is that this process, which is seemingly the only option available, will ultimately destroy the time crystal. Burnham will be able to guide Discovery into the future in her new time suit, but not return to her present. It's a one-way trip. And what follows from this point onwards is half an episode of tearful farewells, sentimental speeches, emotional embraces, and everyone going through their own acts of closure. You can see what the writers were trying to do, but the problem is that it hasn't been done very well — and that's being kind. Watching Burnham go through one tearful farewell after another is too much, and we find ourselves drowning in her emotional blubbering. The command crew gathers on the bridge to bid farewell to Burnham, and even Amanda Grayson (Mia Kirshner) and Sarek (James Frain) suddenly pop up — just in the nick of time, all the way from Vulcan — to gush some over-sentimental "we could've been better parents" speech. The excuse given for their awareness of Burnham's impending doom despite being many light-years away makes this even worse. It's the old Vulcan-katra-can-do-whatever-the-script-requires thing again. 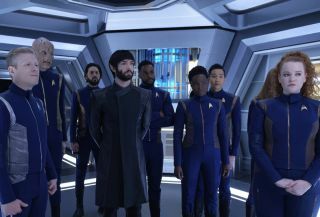 While walking in the corridor Burnham is greeted by the bridge crew, along with Spock (Ethan Peck), Saru (Doug Jones), Tyler (Shazad Latif) and Reno (Tig Notaro), who all insist that they accompany Burnham on this hazardous journey. Naturally, this results in even more top lip-quivering from Burnham, her eyes refilling like a cistern yet again. What follows is a montage of both many of the lesser-known characters — and some of the main ones — in their quarters, recording very personal messages to their families as each prepares privately for what could be a mission that requires the ultimate sacrifice. Tyler (Shazad Latif) tells Burnham he will not be joining her journey to the future. The Enterprise catches up with Discovery, and only eight minutes remain before the Section 31 fleet arrives. Pike prepares to beam over to the Enterprise and appoint Saru as the new captain of the Discovery. Then, in a scene that, despite the unnecessary emotional overload we've already been subjected to will still put a lump in your throat (so imagine how much more effective this could've been), Pike gives a short but stirring speech worthy of the exceptional character he has been. And then the crew stands out of respect to face him, eyes front. The "Star Trek" fanfare should really have played softly in the background here, but never mind. Down in engineering, there seems to be a last-minute technical hitch, as the time crystal isn't charging fast enough. Reno sends Tilly and Stamets away to their respective posts before touching the crystal herself to fix the issue; she gets the same flash-forward as Burnham did. Pike beams over to the Enterprise, and as Georgiou (Michelle Yeoh) operates the transporter controls, she picks an odd moment to tell Pike that she's from the Terran Empire in the Mirror Universe, to which Pike replies, "What Mirror Universe?" And winks. Perhaps she still thinks that he thinks she's Capt. Philippa Georgiou. Regardless, it's a peculiar moment to do this. Tyler also announces that there is something he has to do before the spectacular space battle starts — we suspect it might be to call on L'Rell (Mary Chieffo) to ask for assistance from the Klingon Empire. We'll see. There are a few more of those nausea-inducing, 360-degree pans of nervous-looking crewmembers, and the arriving enemy fleet dropping out of warp, surrounding the Discovery and the Enterprise. Pike issues the command, "Raise shields," and that's it until the season finale next week. The second season of "Discovery" spans 14 episodes, which is plenty of time to show a solid, high-quality story arc. Previous incarnations of "Star Trek" averaged much longer seasons, typically 25 or 26 episodes, but these didn't run season-long stories. "The Expanse" currently averages about 12 episodes and "Battlestar Galactica" averaged 18 episodes per season, so "Discovery" sits roughly in the middle. But both "The Expanse" and "Battlestar Galactica" demonstrate that high-quality, addictive sci-fi drama is possible within these timeframes. However, the erratic pacing and uneven story distribution of "Discovery" has been a major issue since it's premiere, back in September 2017. If the finale was a 2-hour long special, then a penultimate episode of this nature could work, but it isn't. What needs to follow an episode involving this much procrastination would be a space battle even bigger and even better than what we saw in "The Orville" episode "Identity Part II." but that's probably not going to happen either, because so many other plot points have to be tied together in the space of just 60 minutes. Unless, of course … there's an end-of-season cliffhanger that sends us spiraling into Season 3. That might happen. Regardless, as this season draws to a close, we can look at the journey "Discovery" has taken us on and it's been nothing short of … mediocre. The Section 31/AI/Control/Leland antagonist hasn't been particularly engaging and feels fragmented at best. Add to that Burnham's non-stop emotional outpouring, Tilly's inappropriate child-like behavior, ridiculous plots, excessive exposition and the over-reliance on technobabble, the impression this season leaves is memorable for all the wrong reasons. We can only assume that if the spin-off series focusing on Agent Georgiou goes forward,the plan is to create a character that you love to hate, because the vast majority of her lines and interaction in recent episodes have made her out to be a bit of a jerk. And this episode is no exception. The first season of "Star Trek: Discovery" is available to stream in its entirety on CBS All Access in the U.S. and Netflix in the U.K. "Star Trek: Discovery" Season 1 is available now on Blu-ray. The second season of Star Trek: Discovery consists of 14 episodes with no midseason break. It airs on Thursdays on CBS All Access in the U.S. and on the Space TV channel in Canada; the rest of the world can see it on Netflix on Fridays. Follow Scott Snowden on Twitter. Follow us on Twitter @Spacedotcom and on Facebook.